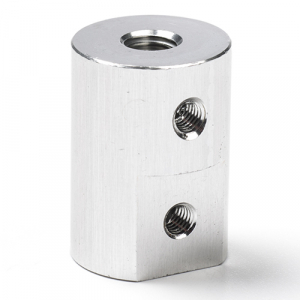 Strong aluminum coupling for connecting your stepper motor to a M5 rod. You can fix the coupling using the hexagonal nuts to the shaft of the stepper motor. Put a M5 nut onto the M5 threaded rod and insert the M5 rod fully into the coupling. Then tighten the M5 nut to fix the rod. You can use grub screws to fasten the coupling to the motor shaft.